So you’ve just started your Invisalign treatment, and you’re amazed at how unnoticeable the trays are. You’re so excited that your new, straighter smile is just a matter of months away. In fact, you’re ready to do just about anything to help it get here as quickly as possible. Fortunately, there are a few simple things you can do throughout your treatment to make sure you’re getting the absolute most out of it. Before you know it, your perfectly straight smile will be staring back at you in the mirror! Consistent oral hygiene is always a good idea, but it’s especially important when you’re using Invisalign. The trays can trap plaque and bacteria against your teeth if you don’t regularly clean them, and this can lead to cavities and gum disease that completely throws off your treatment. Maintain those healthy routines to ensure your treatment stays on track! It’s even a good idea to bring a travel toothbrush while you are out and about so you can quickly brush after every meal. 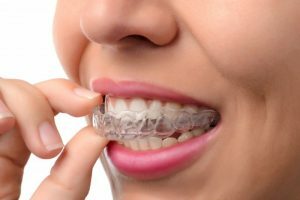 As you can imagine, Invisalign can only work if you actually wear the trays. To get the most out of them, try to wear them at all times unless you’re eating or cleaning your teeth. You can still get great results if you wear them less, but it’ll just take much longer. When your dentist gives you your trays, they’ll also let you know the schedule you need to change them. Make sure to stick to it to keep your treatment nice and efficient. Leave yourself reminders if necessary. You should clean your aligners whenever you brush your teeth. The best approach is to use warm water and some antibacterial soap. Avoid using toothpaste as this can scratch the aligners, which creates areas for bacteria to gather and multiply. You should take your aligners out whenever you’re eating or drinking anything except water. Otherwise, you could break your aligners while chewing or stain them with darkly colored drinks (such as coffee or wine). The great thing about Invisalign is that it’s nearly invisible, so do what you can to keep it that way! Most dentists will ask you to come in for a progress check about every 6 weeks with Invisalign. This will give your doctor the chance to make sure everything is going to plan. If it isn’t for some reason, they can do things to help you get back on track, so be sure to go to these appointments when they come up! Simply enjoy Invisalign! Enjoy the fact that, every day, you’re getting closer to the smile you’ve always wanted. With these easy tips, that day will be here sooner than you expect! Dr. Susan Kutis is a general, restorative, and cosmetic dentist based in Ken Caryl, CO. She simply loves the results Invisalign provides while not compromising her patients’ day-to-day appearance. She currently practices at Blue Sage Dental, and she can be contacted through her website or by phone at (303) 973-1112.